The Framer's Workshop, Berkeley, CA. 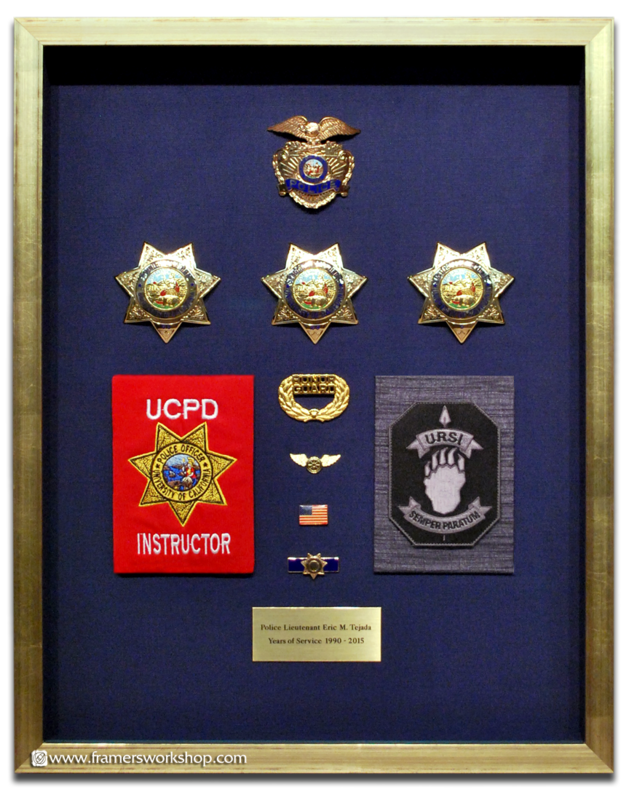 - Framed UCPD Service Award (Badges, Pens, Patches and Plack). We put together this service award for the University of California at Berkeley Police Department. As the USRI patch was so much smaller than the UCPD mounted patch, we mounted the USRI patch on a grey silk raised platform to match the corresponding patch in size. Our custom framer secures badges like these using a special technique that involves no adhesive so that all elements of the collection could be easily removed if necessary. We framed the collection in a deep Larson-Juhl L7 collection gold frame using protective Museum Glass Museum Glass to finish the piece.